ahhh pupster my constant companion. I could not ask for a better friend. The other day I was mowing the lawn (a chore I go into each time with annoyance - why why why does the darn grass grow back?) and pupster was of course outside with me. 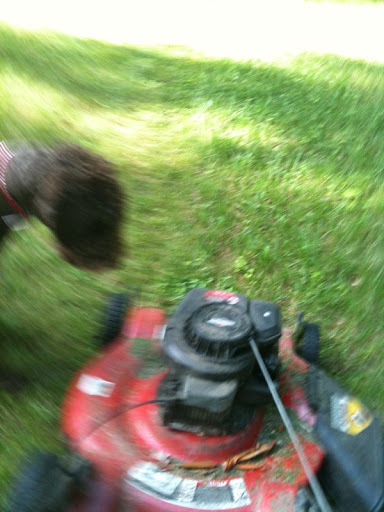 I started the mower and pupster sensing my unhappiness started attacking a running lawn mower. his every motion "I will protect you mommy I will". I took this crazy picture as I shooed him away (to keep him from getting hurt). It occurred to me though this isn't the first time he has "risked it all" for me. If I am particular ly sick in the night he will howl scream or whatever else to get hubster up. And probably most impressively he simply doesn't allow for purging. If I try he sits at the bathroom door and gives the most pathetic whine/howl... And well it's working. I can proudly say I've gone from 5 to 6 times a day to ONCE IN THE LAST MONTH!!! He is pretty amazing this poodle of mine! Much love for you girl. Get in touch if you want. I recently had a similar stint. I'm so proud of you both!